Ages 5 through 8. Promote language learning using versions of Cinderella, The Three Little Pigs, Jack and the Beanstalk, Goldilocks and the Three Bears, and Chicken Little, written specifically for children with language learning disabilities. Each story includes six reproducible sequence pictures, puppet patterns, and a story grammar activity. Skills emphasized include articulation, vocabulary development, sentence structure, telling stories, sequencing, and pragmatics. Two versions of each story are included. These two versions differ in length and complexity. Children with short attention spans or limited language skills may be presented with the short version of the story first. After reading the short version, ask the student to tell the story back to you. Then present the longer version of the story. Listening Skills - Children are asked to listen to stories and to respond to questions related to the story action. 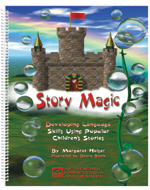 Reading and Writing Skills - Children's versions of the stories can be written down and used for classroom reading activities. The high-interest activities build oral communication skills and skills relevant to academic standards for the language and literacy curriculum.